The first green shoots of new life are emerging after a long period of drought in the north of the country, parts of which were not under government control for close on three decades, and where a terrible war was fought to its bitter end three years ago. Visiting the Vanni after a year it was wonderful to see the new life beginning to bloom, not only in the fertile agricultural lands but also in the towns. There are mid-sized concrete structures in which there are rows of shops that are being built along the side of the main roads. They shone like little jewels in the night as we drove past after darkness had fallen and there was a sense of security whether or not there were soldiers present. On most roads in the Vanni there continue to be army sentries on duty. But they rarely stop passing vehicles and when they do it is only to ask where the travelers are going. This seems to be done more to do something and make their presence felt than for any other purpose. Not only are the soldiers courteous there seems to be no more danger of being turned back at the checkpoints on the grounds that prior permission to travel down those roads has not been obtained. This is a sign that overt military control has diminished. Whether the visible military presence is anymore needed in the peaceful environment of rural Vanni needs to be considered. There are also long still unpaved stretches of road off the main road that do not have soldiers and it was on one of them in Kilinochchi that I took an early morning stroll. There were more people living down that road than were resident last year. More land has also been reclaimed for agricultural purposes and more war-destroyed or damaged houses were being reconstructed. Although it was very early in the morning there was a man planting a coconut sapling and another putting up an agricultural shed. The military shops by the side of the road that sprang up everywhere in the immediate aftermath of the war’s end have been closed. There was much criticism that they were depriving the Vanni people of one source of livelihood. They have now been replaced by shops run by the people of the area. Despite these significant changes for the better there was reluctance amongst the people I met to give credit to the government for contributing to these improvements. When I asked a group of young women receiving vocational training by a religious institution whether they considered the government to be their friend they replied in the negative. A Buddhist monk at one of the meetings I attended made the same point in a different manner. He said that he had tried to organize a signature campaign against the Geneva resolution in Jaffna. The petition he wished the people to sign stated that they were opposed to international interference in the affairs of the country. However, most of the people he had approached refused to sign the petition. They had chided him for wearing a robe and trying to get them to sign such a petition. They had told him it was the Western countries that were protecting the Tamil people and interested in their welfare. The monk bemoaned this attitude as he believed that the government meant well by the Tamil people. At other meetings there were different manifestations of estrangement of the Tamil people from the government. A community leader said that when vacancies arose in government departments in the Mannar District, at least 80 percent of the jobs were given to Muslims with only the balance going to Tamils. This was due to the powerful role played by a Muslim government minister. The group of young women who were receiving vocational training said that they received no support from the government. 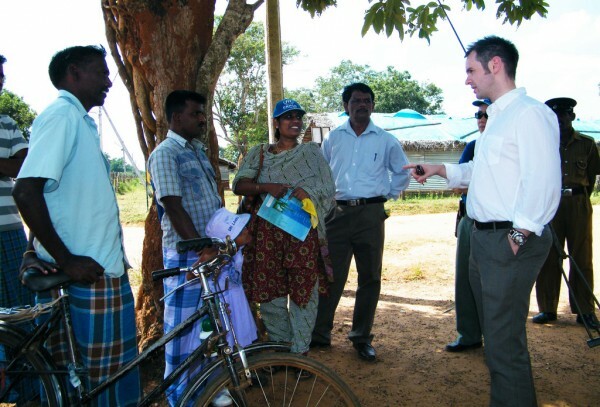 The widows in Kilinochchi who were attending a livelihood development session said the same. The absence of governmental assistance that directly improves the lives of the people was a recurring theme in the Vanni. The people in the North have suffered very much due to the war. Many of them lost their loved who are either missing or dead. Many of them also lost their houses and properties. Many of them lost the savings of generations due to the war. Therefore they feel justified in believing that the government should show them special solicitude and provide them with direct personal assistance. But instead of receiving such assistance they see the government spending heavily on road building and government buildings. As the contracts go to companies outside of the North, most of the labourers recruited to work on those infrastructure projects are from the south of the country and not the people of the area. There is no doubt that the government is spending heavily on improving the infrastructure in the North and elsewhere in the country. The problem is that the majority of the people do not get the direct benefits from these projects while they are in the process of being constructed. In these circumstances, it is natural that they will look to non-governmental sources of assistance. 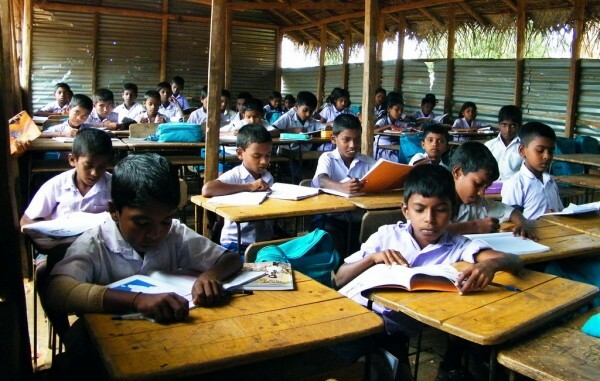 Sri Lanka has a well developed NGO sector with organizations like the Sarvodaya Movement being taken as models for other developing countries in the world. But instead of encouraging the NGOs to play a bigger role in supplementing the shortfalls of the government, the government is adopting a restrictive approach to them. As NGOs are generally closer to the community than the governmental bureaucracy, this is not seen as a pro-people measure. Those NGOs that wish to do work in the North are expected to register with the Presidential Task Force on Northern Development and to obtain approval from that body in order to implement activities. Unfortunately, there is hardly any representation of the Northern Tamil people in that government body. According to the local NGOs in the North, this Presidential Task Force decides on what the priority areas for NGOs will be and will not give them permission to work outside of its priority areas. It appears that the current priority area that is set for NGOs is that of visible development, such as putting up houses, latrines, wells, community halls and providing income generating opportunities. However, not all NGOs are proficient in those areas of work that the Presidential Task Force deems in necessary, and some have different priorities, such as providing leadership training and trauma counseling. They are not given permission which has led some of them to leave the North to the detriment of the needy people there. When the government does not permit non-governmental agencies to fill in the gaps in people’s needs, it is no surprise that the people think of the government as an obstacle to their well being, and not as a source of support. In particular, the restriction placed on community building activities such as trauma counseling and reconciliation is a source of great resentment as it prevents the memories of the past to be healed. Civil society groups in the North report that government authorities have indicated to them that the past should not be re-visited for the purpose of mourning and that the focus should be on the future. This may account for the restrictions placed on trauma counselling and sharing of memories by communities. A crisis now looms with the approach of the third anniversary of the end of the war which will be celebrated by the government in the coming week. In the past two years this has taken place with victory parades and with public commemorations of war heroes. At the same time it is important to remember that the end period of the war was one in which large numbers of civilians who were trapped along with and by the LTTE also died or went missing. In the past two years memorial services conducted by the people of the North have been viewed with suspicion and even been prevented by governmental authorities due to the perception that such memorial services are meant for the LTTE. However, the mourning and remembering of lost ones in the month of May is an important and indispensable part of the process of coming to terms with the past. If this part of the healing process is blocked there can be no moving forward to the future and to reconciliation that transcends the past. The government needs to show more trust in the Tamil people and more care for their concerns if is to win their hearts and minds. Well, the western countries certainly did not play any part in making sure that the kids of the northerners will no longer be recruited forcibly to die in the battlefield. On the other hand, if everything (however small) is done to help this people by the government is attributed to western pressure, what’s the carrot for the government (as politicians) to keep investing in a bad voter bank? The GoSL has a very warped understanding of ‘Development” and no concept of social or human development – hence the unwillingness to let NGO offering psychosocial assistance. Even Sinhala soldiers who are traumatised by war a killing each other but the GoVT will no offer any help. This is mainly because the so-called Minister of Economic Development has not got a basic degree and knows nothing about development or economics! Nor do those cronies in the Rajpakse circle. The so-called minister of economic development is also known as Mr 20 percent and is no doubt making lots of money on all the large infrastructure project contracts that are centralised in his hand via the Presidential task Force (TF) which should be disolved so that local governance institutions can handle reconstruction for people-centered development. The Rajapakse regime’s notion of development are “building roads to nowhere” and sports stadia so that Namal Rajapakse can have car races and drag races and night races. The Central Bank Governor measures development by the number of luxury SUVs on the road. This neo-liberal model of infrastructure development is one that the international doners particularly the World Bank, IMF and ADB are happy about because they can LEND money. This model of “development” increases the DEBT TRAP and is very different from Amatya Sen’s notion of “development as freedom” to enable human capabilities, individual creativity and human security.. which is what is needed at this time. have you forgotten that they do not form a voter bank? They were prevented from voting in the 2005 AND 2010 elections by a combination of intimidation, a lack of transport and far flung polling stations-both the last being arranged for the purpose. There were overwhelming majorities for the opposition but turnout was negligible. With plans for redistricting, the value of whatever votes they have will diminish further. The GoSL measures development in terms of steel, cement, bricks, asphalt and hardware only. That is where the maximum commissions can be earned! Good and timely report by Jehan Perera. Even by external pressure if the GOSL does some development work in the N&E is welcome by Tamils but no gratitude will be given to the GOSL, of course. For the GOSL, there is no need for reconciliation with the Tamils. They can be in power and in control without the support of the Tamils, of course if only the International community can turn a blind eye. Well those days are gone thanks to the previous regimes, now the Tamils are a good voters bank in western world. Timely update by Jehan, Thank You. Any development in the North is welcome by Tamils, No thanks to GoSL. GoSL doesn’t need reconciliation with the Tamils, as it does not depend on their vote bank to hold on to power and control, exept for the International community. Thanks to all the previous regimes, now the Tamils are a needed vote bank in the western countries. Nothing short of eeellllaaaammm, would satisfy the elements Jehan had talked to … What could the SL do? It should continue to improve the conditions of people who had suffered in north not only for humanitarians reasons but also to fulfill government’s responsibility. Should they expect trust in the Tamils who are hellbent on achieving Eellam whether they are in SL or outside? Wait, what? You went down a street and asked a few people? That doesn’t seem very scientific to me. But if you are right, this is a big problem. But, you have to realize that sometimes when a question is asked of people .. the question itself is the first time they even think about it –And frankly it’s at too early a stage. The answer then given may be according to a prevailing but temporary wind. Anyway, after the US Civil War, the two “sides” were bitter like that too .. but eventually they sort of got along. Even today 6 generations later, there are some people in the US who are bitter. Long term, it can be solved with education. Also, ironically, some Sri Lankan politicians are the ones promoting this view that somehow the foreign governments care about Tamils! I am not talking about TNA — I am talking about the ones who are “pro” Sri Lanka. Who goes around claiming that that there is Western pressure in favor of Tamils? Who shouts this the most? Think about it. It appears that Bruno Umbato has not visited the north in recent times and seen the rural folk – how they live and suffer without decent shelter, water/sanitation, livelihoods etc. On paper things are fine but not in reality. One example, government authorities say that fisherfolk are given concessionary loans to purchase boats and gear. However, the fisheries societies affirm that banks have given just three loans to a society and wants full repayment before others get a loan! Bruno has a lurking fear that every Tamil is after eelam or ellam. So many poor Tamils just want a decent life for themselves and their children, just like the Singhalese and Muslims and want to be treated equally like anybodyelse. The government is not doing enough for shelter, water, sanitation, education and livelihoods – it has done very little. The road system is fine, hospitals are coming up but making a living is so difficult for most people in the rural northern areas. Bruno will change his views if only he sees the north with his own eyes! It is very true that none of the “ruling company” has any education!! (what ever “certificates” they may have, are all earned by “back door methods”! More than that they have no sympathy, compassion, justice or common sense!!! All they are interested in is how to fleece the country and earn enough to last for centuries to come!!! It is foolish to expect compassion, justice from thugs, criminals and killers!! !They don’t care about the mental state of the common man or their lives!!! Thank you Henry de mel. It is not that the “pro Govt.” people does not know the true situation, but they just want to “defend” the war criminals and want to justify the almost 60 year long injustice heaped on the minorities by the successive Sinhalese Government!! The discrimination and injustice has reached the climax with this Government!! !”Development” is to get the 20% after doing a shoddy job with everyone concerned making their share!!! « Is GL or Sajin the External Affairs Minister of Sri Lanka?